Dalhousie honeymoon packages are regarded as the most sought after tour packages that let you come face to face with the awesome Dhalaudhar as well as the Pir Pinjal mountains, exuding the snow covered peaks. 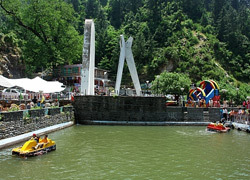 And the existence of River Ravi adds extra charm to your honeymoon in Dalhousie. Dalhousie possesses everything that one expects to find while being on honeymoon in hill stations. Newly weds would love to own snaps with their sweethearts while standing in front of enthralling churches, temples as well as various other attractions that are primarily included in your Dalhousie honeymoon tours. Honeymooners especially prefer to have their honeymoon tours in Himachal since there is no other place similar to Himachal that lets you have the experience the joy of paradise…and that too on the very special days of your married life. So, do make it a point to select the best Dalhousie holiday packages for honeymoon. As you reach Dalhousie through your Dalhousie tour, you come across a number of religious spots that have a lot of significance attached to them. Your Dalhousie honeymoon packages would give you a chance to witness the sight of a series of temples and churches that quite instantly mix the feeling of extreme holiness in your hearts. Yes, your honeymoon in Dalhousie would definitely let you gain the god’s blessings, as you turn your way towards the chief churches such as St. John’s Church, St. Francis Church, St. Andrew’s Church or St. Patrick’s Church. Moreover, the temples such as the Laxmi Narayan Temple, Chamunda Devi Temple, Hariraya Temple, as well as the Shivkul Ashram are likely to add the holy essence to your Dalhousie honeymoon tours. This would increase the distinctness of celebrating honeymoon in hill stations. Apart from the sacred spots, there is much more to your honeymoon tours in Himachal. You both can refresh yourselves by visiting the breathtaking waterfalls as well as ghats such as the Satdhara Waterfall or the Jandri Ghat. Intriguing hills and peaks such as Dainkund Peak or the Bakrota Hills are also a very prominent part of your Dalhousie tours to amuse your imagination completely. A very significant place that you must not miss out while enjoying your Dalhousie holiday packages for honeymoon is the place named as Satdhara. Here, you find the union of seven springs that possess surprising healing and medicinal properties to provide you with amazing benefits. Traditional local Himachal Apple Juice on Arrival. Three Nights stay for a couple with daily Breakfast and Dinner. Flowers in the Room (subject to availability). Famous Apple Wine in the Room on Arrival. Candle light dinner on one evening. One Special evening with Private Bone fire. Chocolates daily in the Room at night. Complimentary Star Gazing once during the stay. Complimentary access to the movie club with selected choice of Hindi and English Movies. One complimentary use of Steam, Sauna Bath and Jacuzzi at the ‘Nirvana Wellness Centre’. Complimentary access to the Movie Club with select choice of Hindi and English movies. 10% Discount on all other hotel services and at our Sister Concern 'Kwalilty Restaurant' at Gandhi Chowk. 20% Discount on Boat Cruises at Chamera Lake. Accommodation for a Couple in Presidential Honeymoon Room (Deluxe Package) / Maharaja Honeymoon Room (Super Deluxe Package). Daily Kesar Milk for the Couple at Night. 10% discount on additional food & beverages. Inclusive of VAT & luxury Tax ( Service tax directly payable as applicable ). Package extendable on Pro-Rata basis ( Sub to Availabilities). Welcome Drinks – Non alcoholic (Tea/Coffee/Juices or Cold Drinks). Cookies or Fresh Fruit Basket on Arrival. Accommodation, Bed Tea, Breakfast and Dinner. Inclusive of Luxury Tax & Vat Tax only.